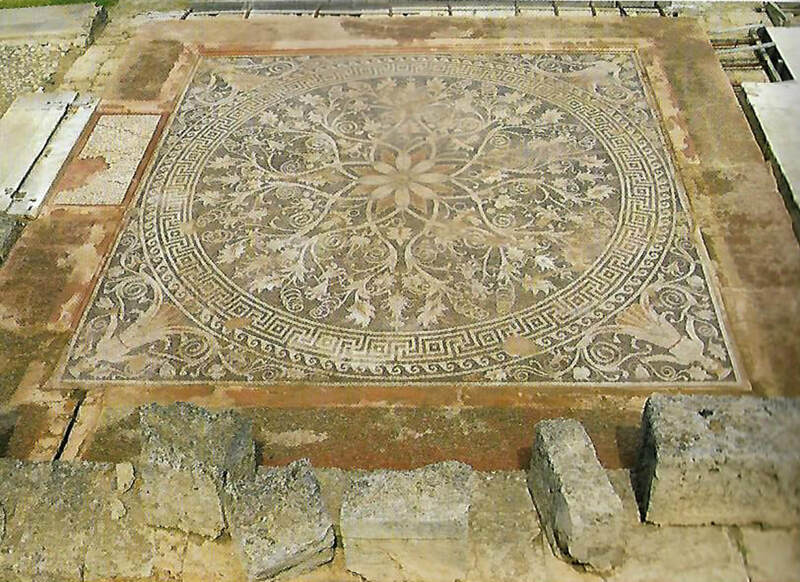 The ancient city of Aigai was the first city and core of the Macedonian kingdom, the most significant Greek state in the North. The place where Alexander the Great was proclaimed king after Philip II, his father, was assassinated in the city's theatre. Alexander started his campaign in Aigai to change the history of Greece and the world. Far away from the typical tourists track around Athens and the islands, Aigai and the museum of the Royal Tombs is the most visited site in northern Greece, a monument of outstanding value world wide, it is in the UNESCO World Heritage List since 1996. The list of the most important archaeological remains at Aigai is endless; the Palace of Phillip II is the biggest, most elaborated and sophisticated building of Classical Greece, the theatre, the sanctuaries of Eukleia and the Mother of the Gods, the city walls, the royal necropolis, containing more than 500 tumuli, the twelve monumental temple-shaped tombs, among them the tomb of Euridice, mother of Philip II and, over all, the unplundered tombs of Philip II, father of Alexander the Great and Alexander IV. They provide the high pick of the ancient Greek art of late classical period (architecture, wall paintings, weaponry, jewellery, metal work, ivory sculpture)​. Discovered in 1977-8 they made a worldwide sensation. The quality of the tombs themselves and their grave-goods places Aigai among the most important archaeological sites in Europe. 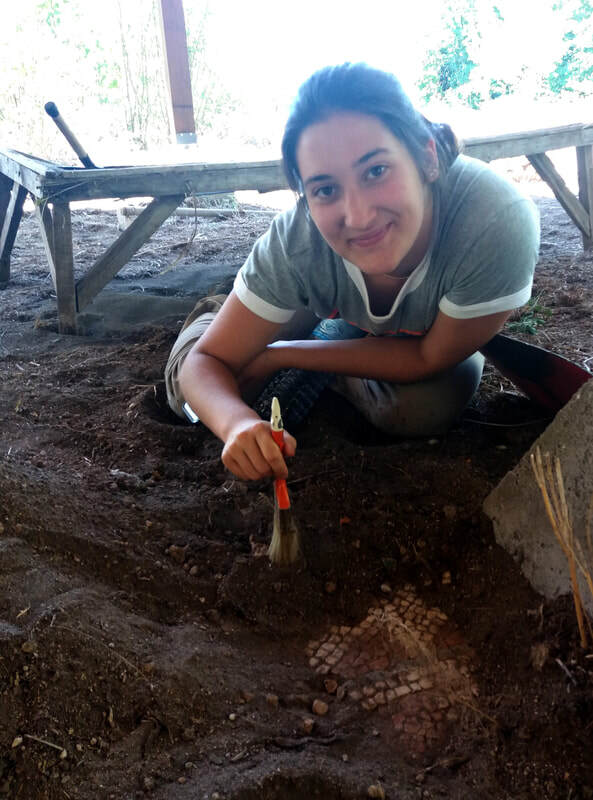 During the last decades, the archaeological works in the area of Aigai continue under the direction of Angeliki Kottaridi, director of the 17th Ephorate of Prehistoric and Classical Antiquities. 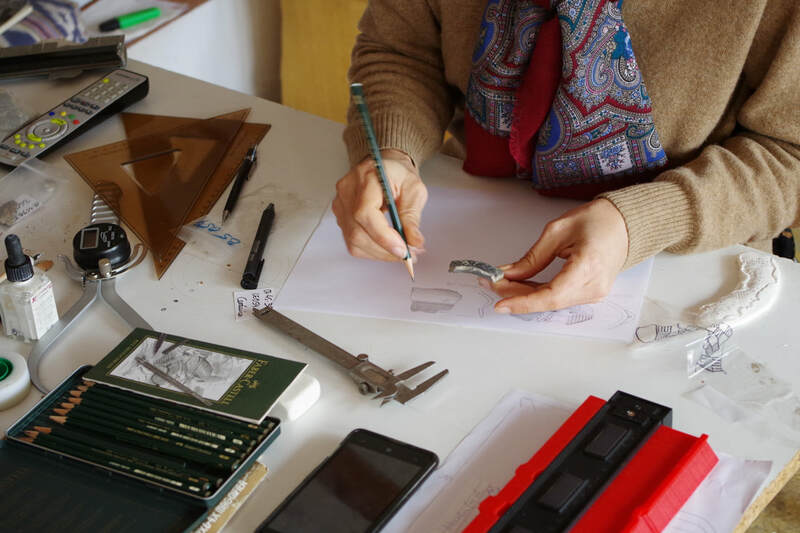 They are focus on the incredible restoration of the Palace of Philip II, the creation of a model archaeological-ecological park at the royal necropolis of Aigai, the design of exhibitions at the museum and the creation of a new museum. 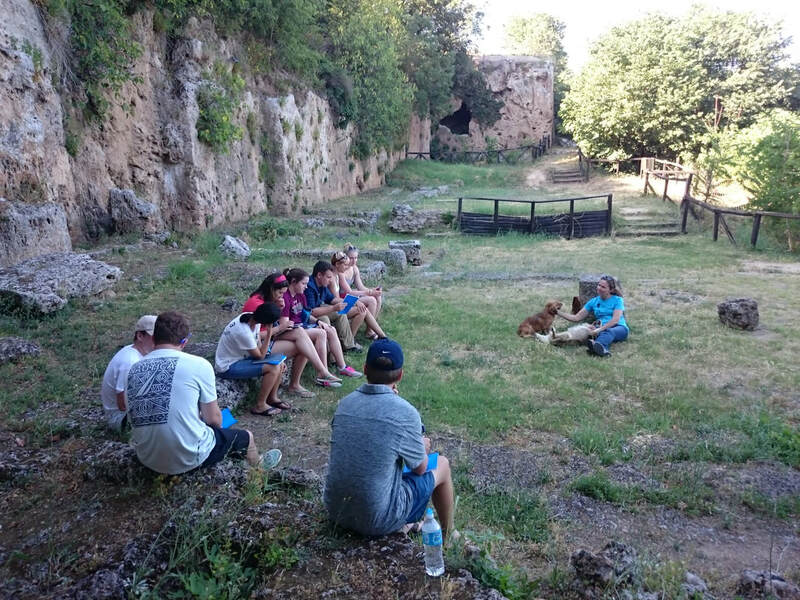 This educational program will be focus on the study of the tumuli under the incredible landscape formed by hundreds of tombs that lie in front of the Museum and tomb of Philip II. 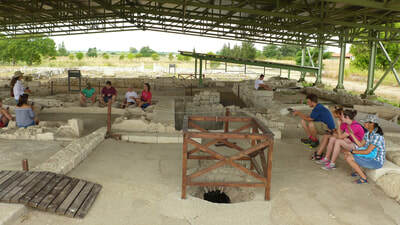 Pela: archaeological site and Museum. In the first century AD a terrible landslide covered the city. The survivors built a new town in the plain and the name "Aigai" and the Temenids fell into oblivion. Only the memory of the palace survived with the name of the little village; Pallatitsia. 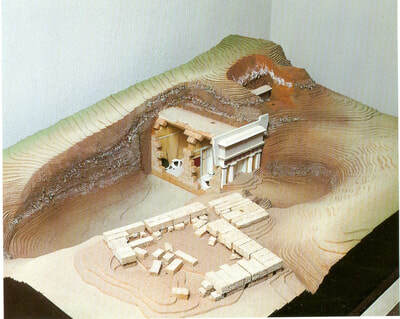 The first excavations date to 1861, a Macedonian tomb was discovered east of the Palace by Leon Heuzey and Henry Daumet. 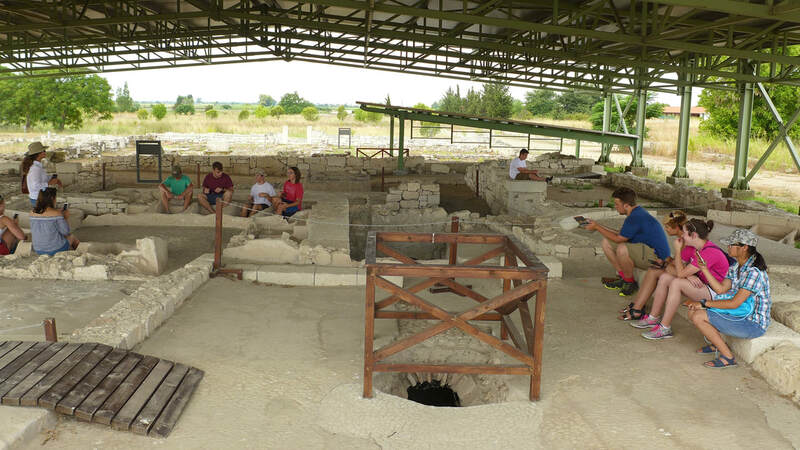 In 1922 the village of Vergina is founded by Asia Minor Greek refugees on the northeast side of the palace, using the ancient ruins for construction. The excavations at the palace started again in 1937 under the direction of Konstantinos Romaios, professor of Archaeology of the University of Thessaloniki and a Macedonian tomb was found. 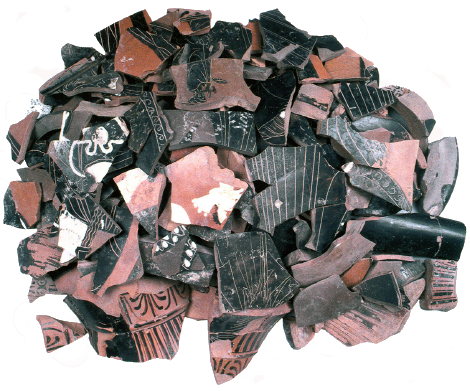 Manolis Andronikos started to excavate in the cemetery of the tumuli area from 1949 to 1960. 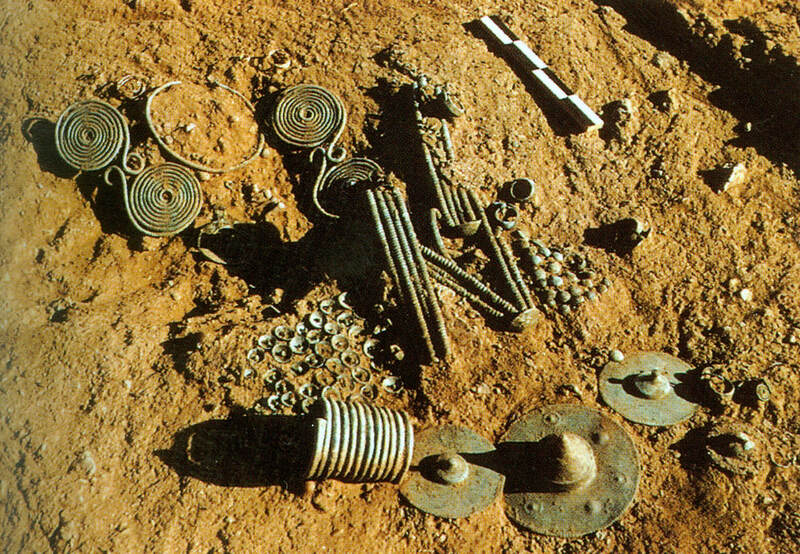 In 1976 the famous archaeologist started to excavate the great tumulus and discover the tomb of Philip II and all his treasure. The media named this discovery the finding of the century. 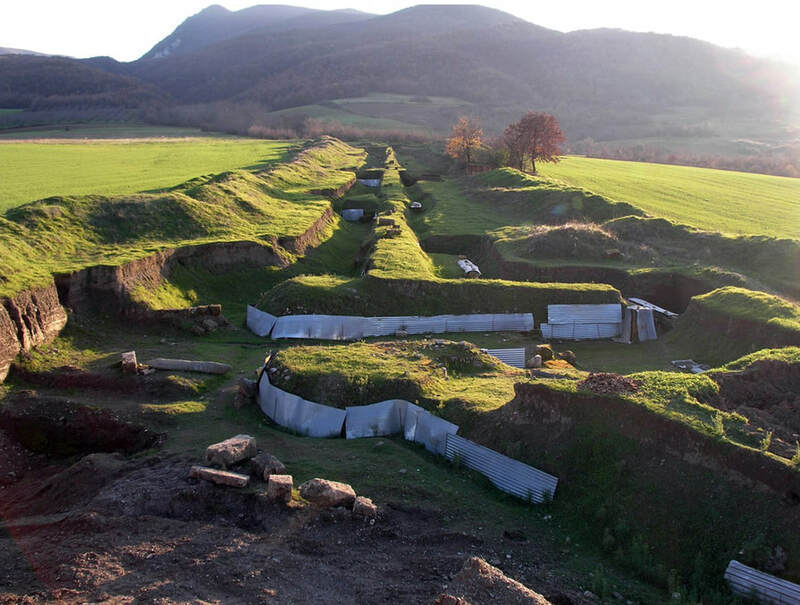 The Tumuli Cemetery of Aigai spreads between the modern-day villages of Vergina and Palatitsia. More than 500 burial tumuli constitute the core of the archaeological site of Aigai and one of the most extent, original and well preserved ancient Greek cemeteries. 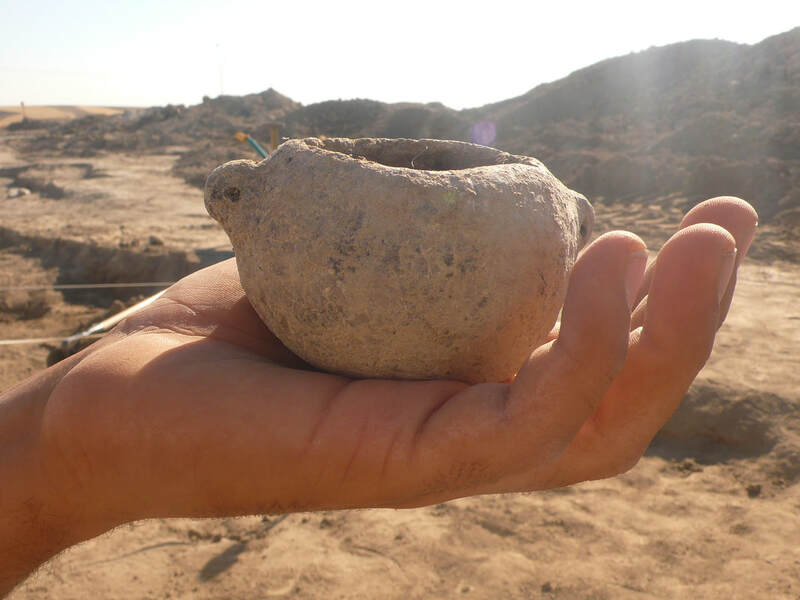 Its oldest burials date up to 11th cent. BC. The main use of the cemetery dates to the Early Iron Age (1000-700 BC), the time of the composition of the Homeric epics. 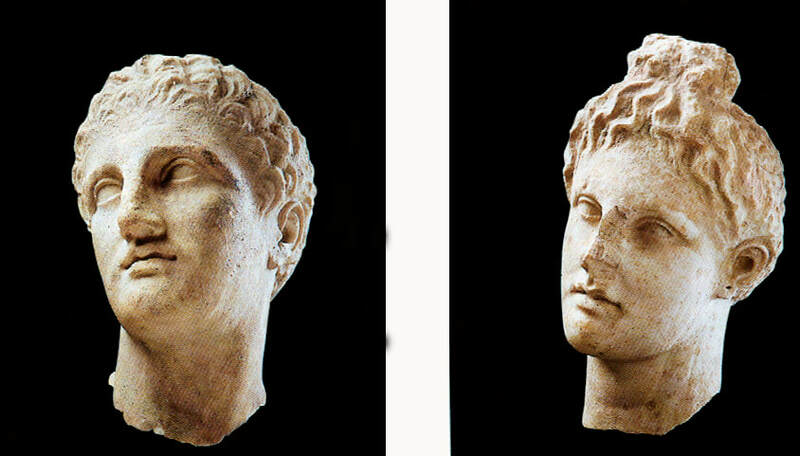 The North of Greece preserved the archaic social structures of Homer's epics until the Hellenistic age and the traditional burial customs continued the same among the aristocracy. 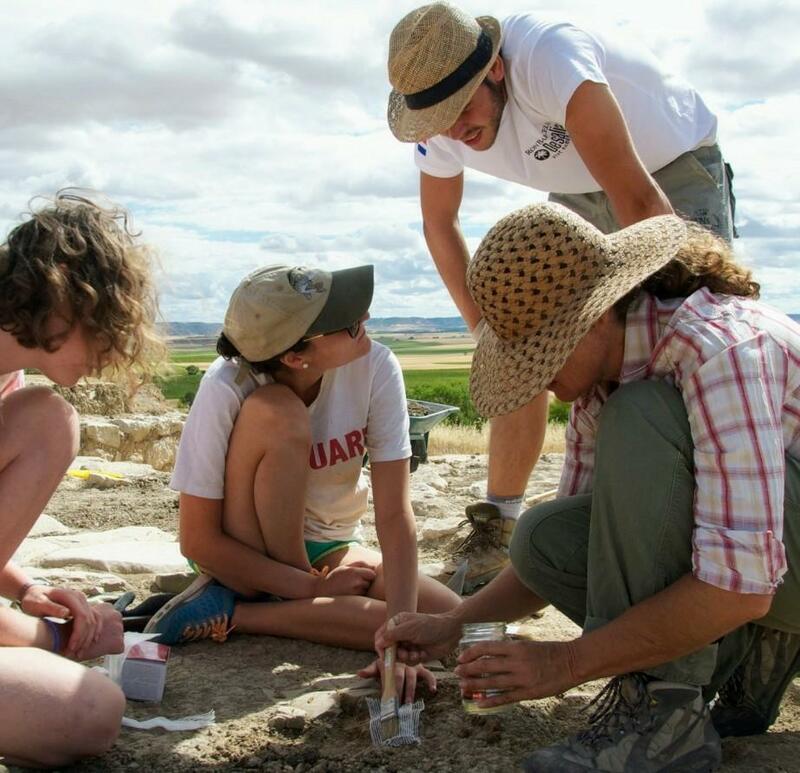 ​The excavation of a single tumulus will provide ArchaeoSpain participants a unique experience of studying the architecture, burial customs, material culture and art of ancient Greece. Drougou S. Saatsoglou Ch., Vergina: Reading around the archaeological site. 2005. Pandermalis, D. Alexander the Great. Treasures from an epic era of Hellenism. Vergina is a small town in northern Greece, part of Veroia municipality in Imathia and 95 km from Thessaloniki international airport. The city lays in a beautiful setting at the foot of Pieria montains with the incredible open view over the rich and beautiful Macedonian plain. The hotel is opposite the royal tomb of Evridiki. The traditional Macedonian architecture of Hotel, knitted in harmony with the natural beauty of the area and the region, create the ideal environment for accomondation and relaxing getaways in history and nature. The hotel have fully equipped and spacious rooms, double, triple and four-bedded, with balcony overlooking the ancient palace of Aigai, The rooms have heating, air conditioning, a telephone, a refrigerator, satellite TV, hairdryers, irons, a bathroom and free wireless internet. The hotel has a lounge with satellite TV where you can relax and play board games, the dining room has a fireplace and you can enjoy the traditional local recipes and cuisine, local wines and a full breakfast of local pure products, which can be enjoyed on the balcony, terrace or in our large privately owned olive grove area or under the shade of the sycamores. The remainder of the program cost will be due by May 15th. -Between March 1st and May 15th: Application fee non-refundable. The remaining balance is refundable. -After May 15th: All payments are non-refundable unless your application is rejected by the program director. 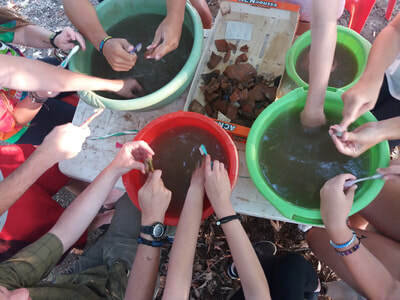 Studied Archaeology and History of Art at the Philosophical School of the Aristotle University of Thessaloniki. Having received a scholarship by the German state, she has continued her studies in Classical, Prehistoric and Medieval Archaeology, History of Art, Ancient and Medieval Literature, Ethnology and Theatrology at the University of Cologne, where she has earned her PhD. 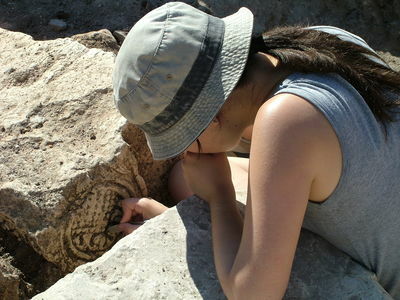 She has worked for several years as an assistant of Manolis Andronikos at the excavation of Vergina, and in 1991, as the first successful candidate of the examination of the Archaeological Service held in 1989, she joined the staff of the Greek Ministry of Culture, in the 17th Ephorate of Prehistoric and Classical Antiquities, initially as a curator of antiquities in the Aigai archaeological site and Museum in the south Imathia area and then as a Head of the Department of Museums, Exhibitions and Educational Programmes. 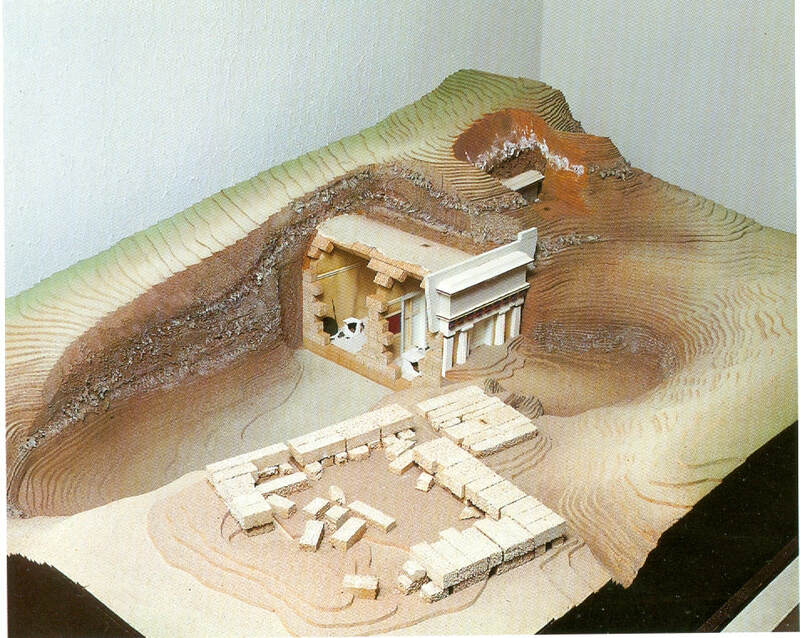 ​In 1977-8 the royal tombs were discovered by the archaeologist Manolis Andronikos. Until their discovery, the tombs were covered by a tumulus 13 m high and 110 m across. It must have been constructed at the beginning of the third century bc by Antigonos Gonatas, to protect the royal tombs from further pillaging after marauding Galati had looted and destroyed the cemetery. 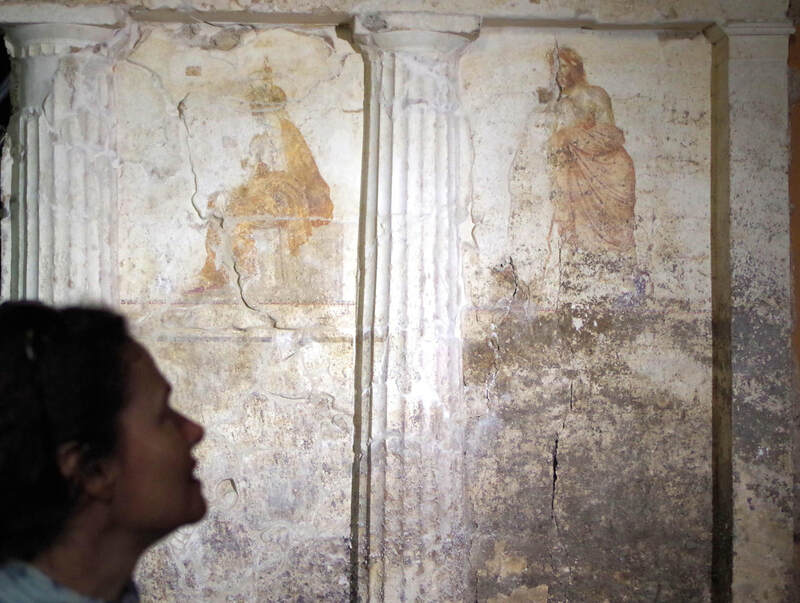 The museum was comstructed undergrownd in 1993 to enclose and protect the royal tombs. 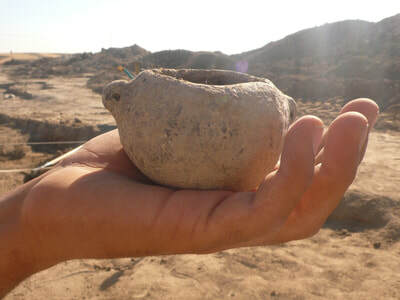 From the outside, the building looks like an earthen mound; inside, the treasures found in the royal tombs have been on display since November 1997. Apart from the sepulchral monuments themselves, there is an open area of 1,000 sq.m., where the finds from the tombs are displayed in showcases. Lighting is very subdued to draw visitors’ undivided attention to the exhibits. Constructed during the reign of Philip II (359-336 BC), the palace of Aigai is not only the biggest but, together with the Parthenon, the most significant building of classical Greece. Built on a raised outcrop of the hill, this huge building –the biggest in classical Greece and three times the size of Parthenon- was visible from the whole Macedonian basin; a remarkable landmark, a symbol of power and beauty. The palace of Aigai was designed for Philip and constructued probably by architect Pytheos. It isA unique building, utterly revolutionary, will become an archetype of all basileia (kingdoms). ​​Veria stands on a high plateau in the east foothills of Mount Vermion and has been continuously inhabited from at least the Archaic period until the present day. The original core of the city was a small area that was converted about the end of the 4th century BC into an organised urban centre, and experienced its first great period of prosperity as early as the 3rd century BC. 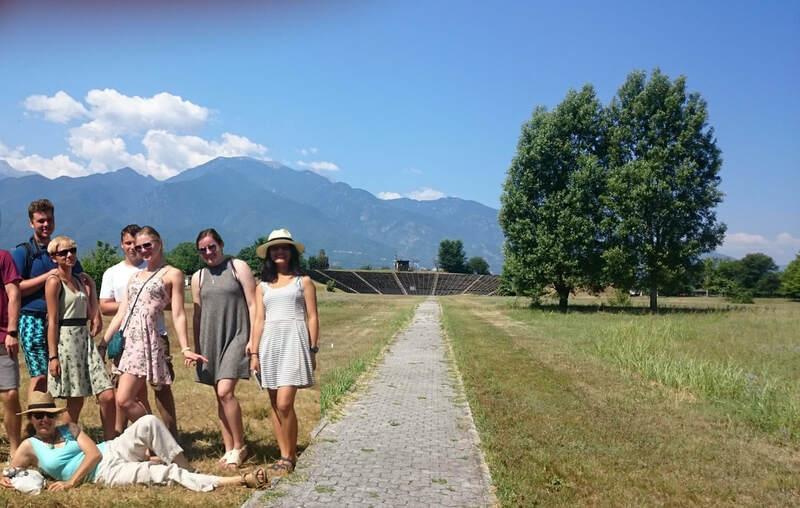 ​​Ancient Mieza occupies a prominent place amongst the cities of "lovely Emathia", as Homer calls it, which flourished during the time of the Macedonian kingdom (4th-2nd century BC) The city is known to date from its cemeteries and also from a number of important antiquities. 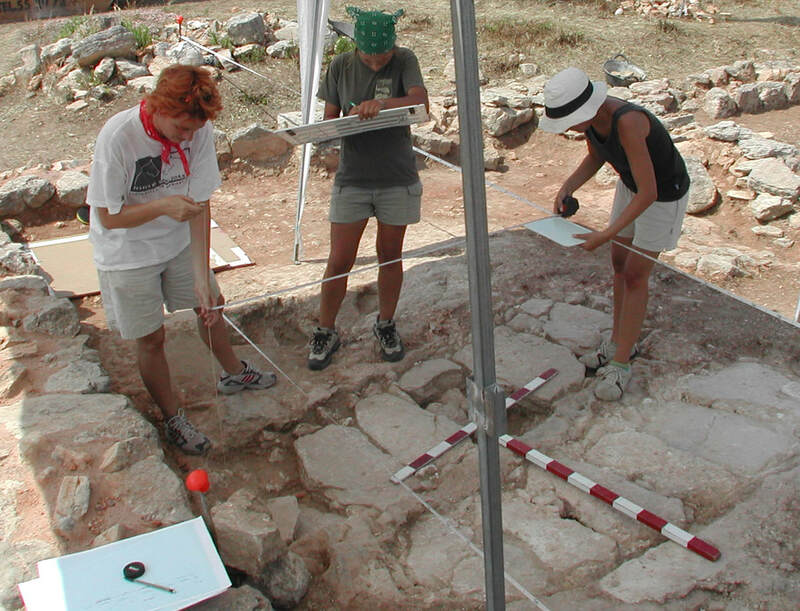 Recent excavations have gradually uncovered the public administrative centre of the city at Belovina Kopanou. 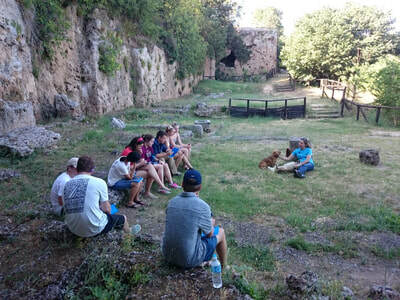 The importance of the city in the Hellenistic period is revealed by two large porticoed structures, one over 150 m. long, and a theatre with seats cut into the rock and a poros stage structure. SCHOOL OF ARISTOTLE - NYMPHAION. The idyllic countryside at Lsvoria is the setting for the place where the Nymphs were worshipped and where, according to Plutarch, the young AJexander was taught philosophy, the arts, and mathematics by Aristotle. MACEDONIAN TOMBS. 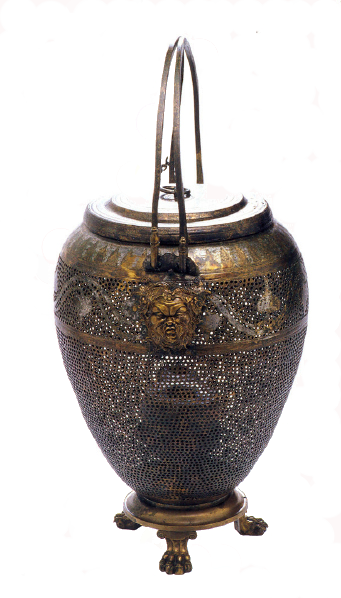 Six tornhs, with one or two chambers, dating from the early 3rd to the early 2nd century BC, are preserved in the area of Mieza, four of them in a good state of preservation. 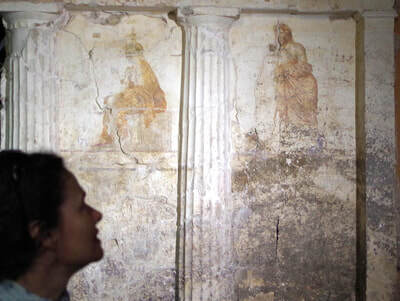 In three of them painted decoration survives, though in the case of the fourth, "Xinch's Tomb", the fine wallpainting depicting a Macedonian horseman attacking a Persian foot soldier has now disappeared. ​Pella, capital of the Macedonian state from the early 4th century BC, reached the height of its prosperity in the Hellenistic period. 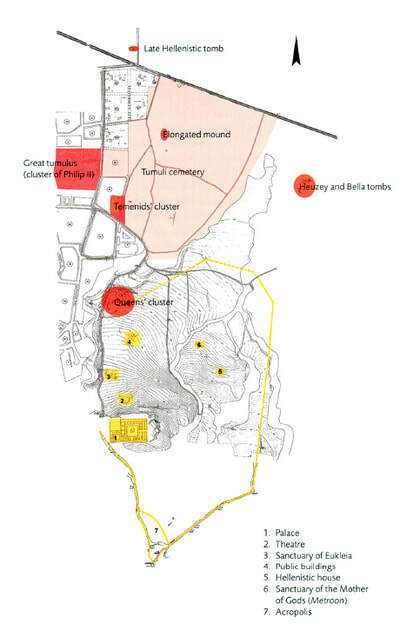 Pella evolved from the early 4th century BC on the Hippodamian system of urban desigm. This involved laying out the city in regular building blocks, defined by straight horizontal and perpendicular streets. This plan made it possible for the city to expand dynamically over the three centuries of its life. THE MUSEUM. 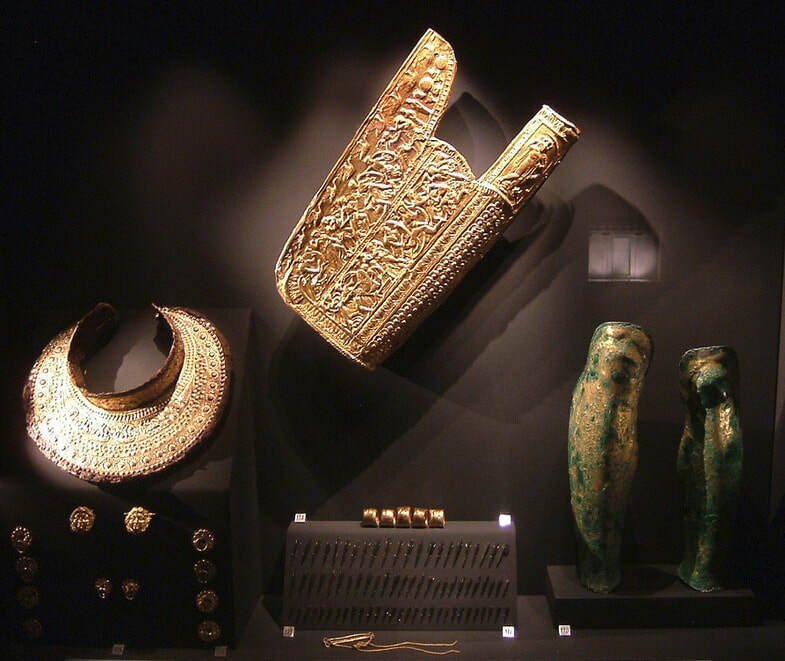 The Pella Museum houses finds from the archaeological site at Pella. The exhibition is organised around units corresponding to the sectors of the archaeological site created by the long-term excavations. The Museum has three rooms. The larger part of room A is devoted to the prehistory of the surrounding area, and the history and urban design of thc city. Thc rectangular recess on the left side of the room contains the unit dealing with the private dwelling in Pella. Thessaloniki is the second largest city of Greece. Built near the sea it is a modern metropolis bearing the marks of its stormy history and its cosmopolitan character, which give it a special beauty and charm. The ancient forum (dated to the late 2nd or the early 3rd century AD) with squares, porticoes, additional buildings and odeum (293-395 AD), the palace complex of Galerius Maximianus (4th c. AD), the thermae, the hippodrome, the temples. In the south square, is the famous Stoa of the Idols, which was two-storeyed and lavishly decorated. The Triumphal Arch of Galerius (Kamara), built in AD 305. The Rotunda is an early 4th century building which later was converted into a Christian church. City walls, archaeological site of a cemetery basilica, a martyrion and Early Christian graves, the byzantine bathhouse ), The Heptapyrgion castle that was raised in stages, from the early years of the Byzantine Age into the Ottoman period and several churches like these of Acheiropoietos (5th century), the Holy Wisdom of God (Hagia Sophia) (7th century), the Panaghia (Virgin) Chalkeon (1028), Agios Demetrios a splendid basilica dedicated to the patron saint and protector of the city, etc. This is the first year of this incredible project and we would love your comments after your Greeck experience. Here you have some notes from people who were on the field with us in past years. This is not to say that science lost to speed. Far from it! Though the somewhat strange ‘triangle’ method made for shoddy plotting of artifacts in the field, when we returned to our headquarters we were able to plot those points with precision. 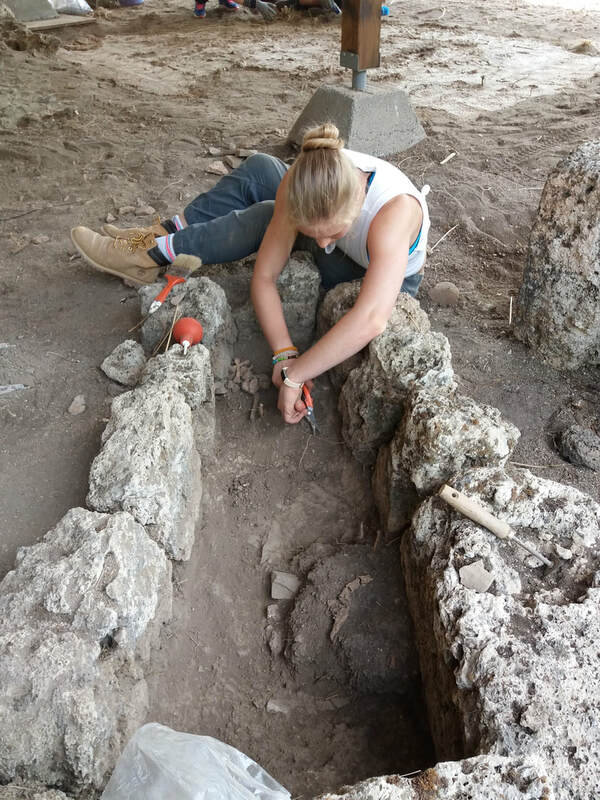 Everyone took very detailed notes of what was done every day and made plan maps, so at the end of the dig there were seventeen different accounts of what was done.